Hello fabulous readers! Can you believe Stylish Heath is a year old? The year has gone by so quickly, and I am thoroughly enjoying the blogging experience. I have connected with so many of you through comments and emails, and love that you are sharing your creative ideas on everyday elegance and beauty. But what makes blogging so gratifying is taking an idea, interpreting that thought into a stylish creation and then honing in on the aesthetics of gracious living through art, fashion or cooking. I truly appreciate all of you who read the blog regularly and take an interest in an earnest discussion on a recent post when I meet up with you. Thank you so much for your support and allowing me to provide an artistic venue with each of you. To a Stylish Birthday and Many More!! 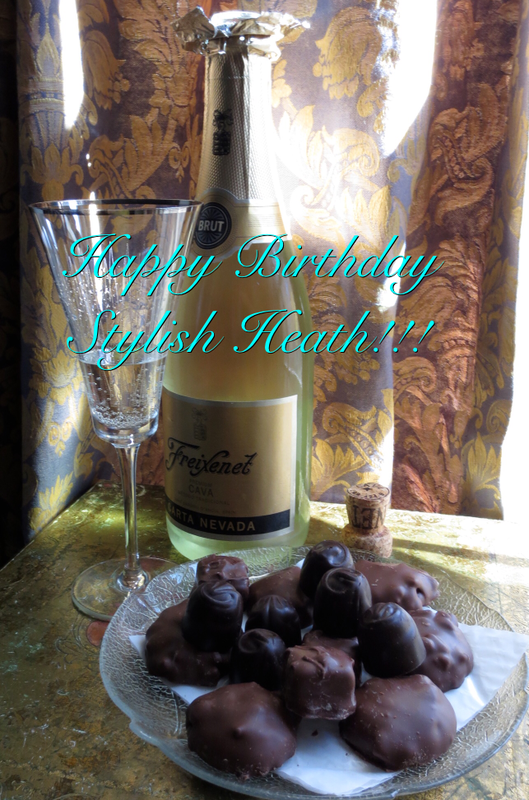 Happy Anniversary Stylish Heath!!!!!!!. Congratulations on 1 year of stylish blogging. I have thoroughly enjoyed your posts and always look forward to reading the next. You provide so much information with cooking, art and fashion in your posts coupled with the usual twist of class and style. I’m inspired by your blog and I hope for the best in many more years of your style of blogging. Nice job Kathleen…………. Happy Birthday Stylish Heath! Indeed it has been a very good year for you and I have enjoyed all your posts. You have given new meaning to living the good life. I always look forward to your new posts and I really like your depiction above of the Brut Cava and chocolates. Salud! Hi Mark, I appreciate that you have enjoyed the post and living the good life within an affordable budget….stay tuned for more!!!! Hi T, thank you so much for following Stylish Heath, I cannot believe it has been an entire year, and there is definitely more to come!!! Happy Birthday Stylish Heath, keep writing your beautiful words.I love it!!!! I am so thrilled I was able to fulfill an entire year of blogging and thank you so much!!!!! Your words are very kind and I feel even more inspired to continue blogging. Thank you so very much!!! !